Ticketed for Wearing a Speedo! Shower Curtain Smell? Yup, Toxic. 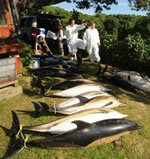 Dolphin "Mass Suicide": Is Sonar to Blame?